Here's a beautiful copy of this hard-to-find Mystics single, which features two dynamite Doo Wop dancers. 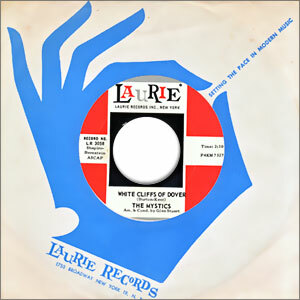 Note: This 45 record comes in a vintage Laurie Records factory sleeve. It grades very close to Mint across the board (Labels, Vinyl, Audio). Condition Detail:Label: M- | Vinyl: M- | Audio: M-Written by: R. Giardino-L. Cohen (A), Burton-Kent (B)Chart info: Not charted 1960Track time(s): A: 2:10 | B: 1:45Mix: MonoOther info: Contains 45-only, non-LP track(s).